Hello everyone. I hope you are enjoying seeing the autumn colours all around us. I used them for inspiration for the card I am sharing with you today. 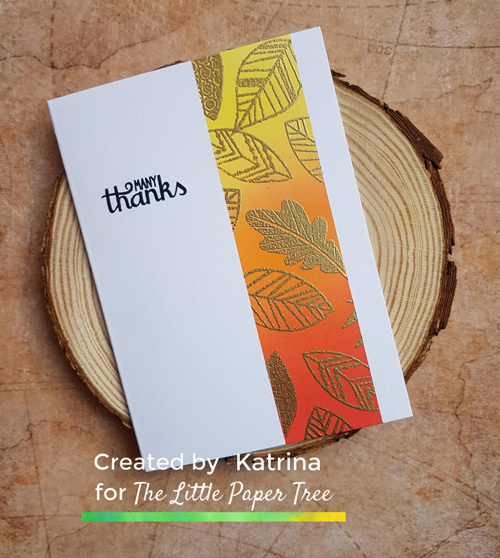 I used the stamp set from Catherine Pooler to create a clean and simple thank you card with a pop of autumn colours, which was quick and easy to make. To start the card I made a card base from white card stock. I then used purple tape to mask off a section of the card to ink blend using Distress Oxide inks in autumn colours. Once I was happy with the blend and the ink was dry I used a powder bag over the area to prepare it for some heat embossing. I used a embossing pad and stamped the leaf images from the stamp set randomly over the inked area. I then sprinkled gold embossing powder over this and heat set it with a heat tool. Next is the best bit…. peeling back the purple tape! I wanted to keep the card clean and simple so I finished off the card by simply stamping a sentiment from the stamp set with black ink. I always use a stamping tool at this point so that I can have a perfect sentiment as I was stamping straight on to the card base. That finishes up the card.I hope you like it.